Frugal dating in Boston usually means eating dinner at cafés, food trucks, and secluded “hidden gems” that come with a higher chance of salmonella poisoning than one would hope for. But Jim Solomon, owner and head chef of the Fireplace restaurant, is changing that. The Fireplace offers oh-my-god-good tasting events every other weekend that are not only upscale and delicious, but crazy affordable. For around $25, you can attend a “Fireside Chat” tasting at Soloman’s award-winning restaurant in the heart of Brookline. Go ahead an pinch yourself, but you’re not dreaming. I went in on a Sunday for a one-on-one tasting with Justin Garnache, an on-premise specialist for Bay State Wine and Spirits. If there’s such a thing as a wine guru, it’s Garnache–this man knows wine. Loves it. Loves it more than you love your own mother, probably. And when you get the low-down on a product from someone who’s that into it, it means two things. 1) You’re going to be entertained, and 2) You’re going to learn. What’s the story behind these chats? These mega-informative wine tastings are Soloman’s brainchild. At one point he, too, had no idea what the deal was with wine, so he did something about it: he traveled to Napa Valley, California to get educated by the nation’s premiere wine experts. And when he came back to the east coast, he brought all that knowledge with him and turned it into a super-informative, highly digestible (pun intended) wine tasting. Fireside Chats are designed to mimic the kind of knowledge you’d pick up at a winery in Napa without having to leave the state (or region, for that matter. As I learned while I attended a tasting last weekend, New England climate + grapes = bad). You’re getting the attention and quality of an event from out west in a cozy, award-winning restaurant in Brookline. Who are the Fireside Chats for? “I think the wine tasting is probably most useful for those that enjoy wine but have always felt just particularly confused about the differences between pinot noir and cabernet sauvignon and merlot,” Soloman said. All are welcome, and, most importantly, all will feel welcome. 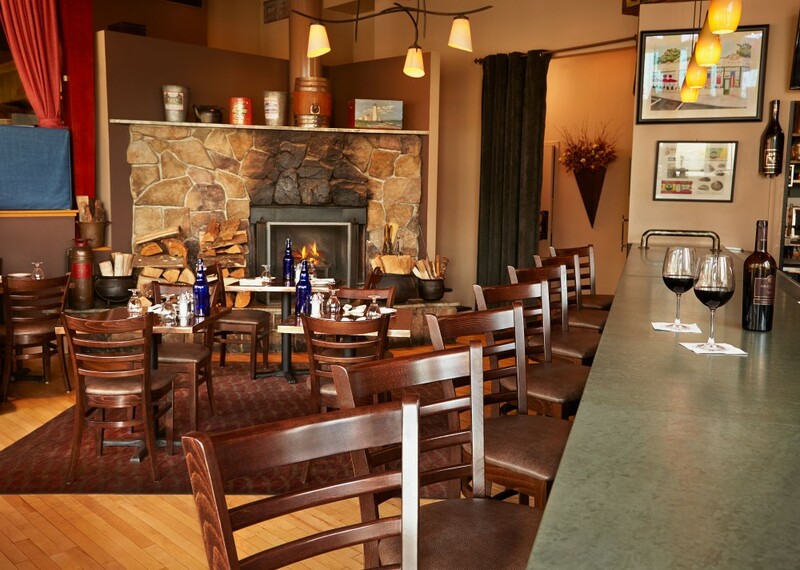 What separates the Fireside Chats from other wine tastings in the area? The way Garnache tells it, a whole lot. But most impressive is the food, which Garnache said has a codependent relationship with wine. By including food in his tasting, Soloman is taking the experience to the next level. Fireside Chat offered me a four-course tapas selection during the tasting, which is apparently incredibly rare. What are some of the other upsides of a Fireside Chat? Soloman also makes a point of donating to charities, which he said was partially the impetus for organizing the tastings in the first place. He said he was having a hard time finding a way to donate in a way that made sense for his business, since giving away dinner for two on a regular basis can mean tossing out some serious cash 💸. Fireside Chats became the happy medium. Fiscal and philanthropic. Alright, alright, alright. The wine sounds great, but how’s the food? Dope. All I eat is bagels and Oreos, and even I know that food was 💯. I’m talking you-gotta-try-this amazing. I didn’t eat the heavenly creation photographed above, but I had to put it in so you could get an idea of how delicious the food is. And I didn’t get a chance to ‘Gram my own tapas because I was too busy shoveling it into my mouth. Not for nothing, the Fireplace won Best of Boston in 2008 for “Neighborhood Brunch in Washington Square” and Boston Magazine’s People’s Choice for Best Burger in Boston 2012. Nope. He ain’t cool enough. Also, like, long dead. This sounds sick! When can I go? Next weekend. And then a couple of weekends after that. And a couple of weekends after that. And so on. There will be a Petite Syrah tasting on November 14, a Pinot Noir tasting on November 28, a Single Malt Scotch tasting on December 5, and a Sparkling Wine event on December 19 (which will be spearheaded by Garnache, who told me that this particular tasting is his all-time favorite). In conclusion: Food trucks be damned. For roughly the cost of a weekly T pass or an oil change, you can practically steal an upscale dining experience this weekend. Don’t miss out. To learn more about Fireside Chats, talk to Jim Soloman, and/or make a reservation for an event, visit their website by clicking here.